Plot. Income: 4. Initiative: 8. Claim: 1. Reserve: 6. Plot deck limit: 2. The March on Winterfell #40. 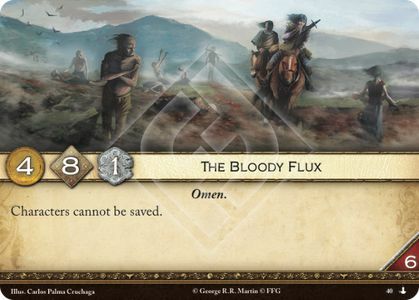 Craster can be saved while The Bloody Flux is revealed because he is immune to Omen plots.